Bangladesh Premier League 2019: Banned Australian cricketer David Warner played a bizarre shot in Sylhet during a Bangladesh Premier League match. Bangladesh Premier League 2019: Banned Australian cricketer David Warner played a bizarre shot in Sylhet during a Bangladesh Premier League match. 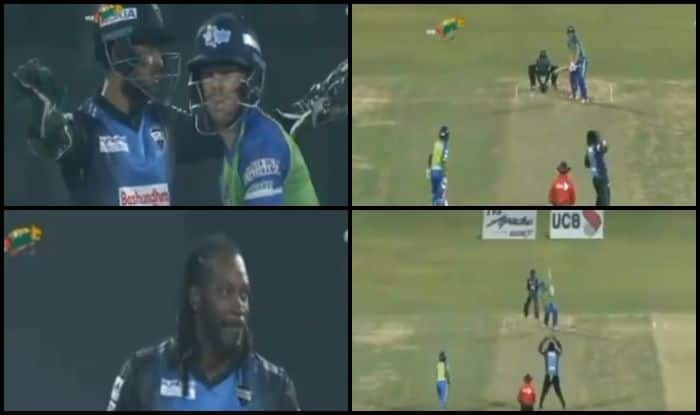 The southpaw did not switch, he took guard as a right-hander when on 47 and smashed Chris Gayle for a huge six down the ground to get to his fifty. Warner’s 36-ball 69 blitz was entertaining while it lasted. His innings was laced with six fours and two sixes. But, Warner playing as a right-hander is the strangest thing ever. The Sixers posted a challenging 187 in their stipulated 20 overs. Liton Das was the top-scorer for the Sixers as he smashed a 43-ball 70. It was the penultimate over of the innings when Gayle decided to come round the wicket, but it turned out to be a juicy full toss, which Warner smashed out of the part. The surprising bit was that Warner played like a proper right-hander. In the meantime, the crowd and Warner’s teammates from the dugout clapped for him. In the last ball, Warner brought out the reverse-sweep and the leather evaded the fielder at the short fine leg region to speed away to the boundary. Audacious from David Warner! At the time of filing the copy, chasing 188, the Riders were 117/4 in 14 overs. Big fish Gayle departed for seven whereas Alex Hales was out without scoring and that hurt the Riders.